Head to Melbourne Central and Melbourne's GPO - Shopping Centrefor some retail therapy. 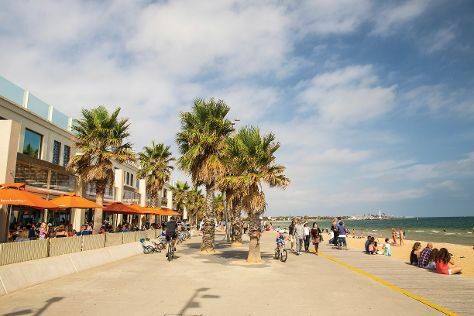 You'll get in some beach time at St. Kilda Beach and Catani Gardens. Venture out of the city with trips to Koala Conservation Centre (in Cowes), The Great Ocean Road (in Torquay) and Sovereign Hill (in Ballarat). Spend the 11th (Sat) wandering through the wild on a nature and wildlife tour. There's lots more to do: brush up on your military savvy at Shrine of Remembrance, admire the landmark architecture of Old Safety Deposit Building, admire the natural beauty at Royal Botanic Gardens, and tour the pleasant surroundings at Melbourne Zoo. To find traveler tips, where to stay, and more tourist information, refer to the Melbourne sightseeing planner. If you are flying in from Singapore, the closest major airport is Melbourne International Airport. In May, daytime highs in Melbourne are 20°C, while nighttime lows are 9°C. Finish up your sightseeing early on the 14th (Tue) so you can travel back home.